Are Students Sick & Tired of Anti-Bullying Messages? And What About You? I’ll admit it. Sometimes I have doubts. Not about bullying, exactly — I know it’s a serious issue, a matter of life and death — but I fret about the effectiveness of talking about it. You could call it an occupational hazard. Does anyone hear the message anymore? Anti-bullying rhetoric seems everywhere these days. Trending hot on Twitter. Almost fadish. And I sometimes wonder if kids have tuned it out. In my travels, I’ve talked to many teachers who have expressed that worry. This year, I’ve visited schools in OH, MA, FLA, MI, NJ, NY, SC, PA, and CN — often because I wrote the book, Bystander. 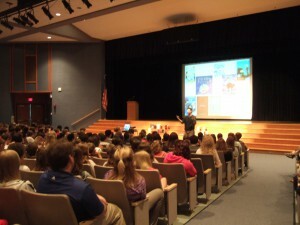 I’ll arrive at a school where all the middle schoolers, grades 6-8, have read and discussed my book. They’ve wrestled with the issues, hopefully identified with characters, felt compassion, empathy, anger. Or, I guess, some of them have just been bored by another book they didn’t get to select themselves. 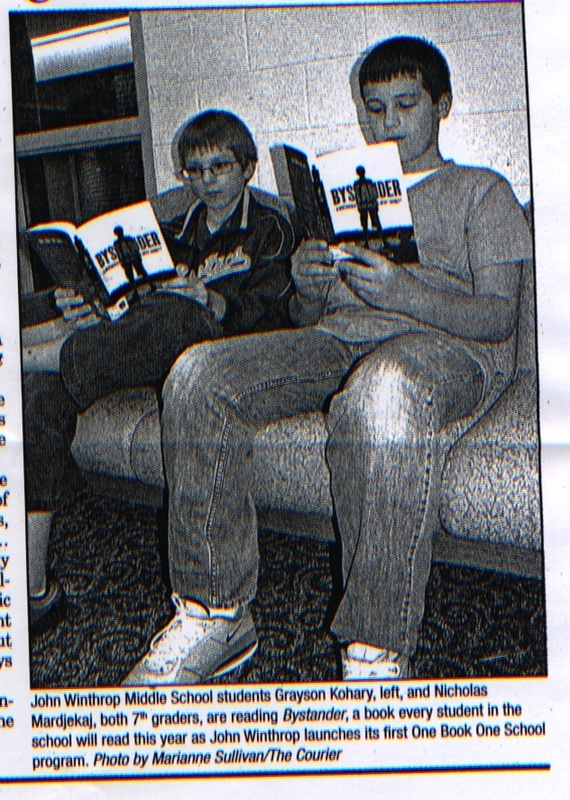 In most cases, my novel is only one small piece of a comprehensive anti-bullying agenda. Despite the amazing letters I receive, I still wonder what I can say on a school visit that won’t come off as yet another lecture to this audience. What can I say that might make a difference. And if, perhaps, they simply can’t hear it anymore. Is it worth beating on that same old drum? Then I opened up The New York Times and read Nicholas D. Kristof’s op-ed piece from Thursday, May 17. And I’m reminded, yet again, why this matters so very much; and how real people — the children in our village — are powerfully effected every single day; and that anything we can do is far, far better than sad resignation. As an author and father of three children, ages 11, 12, and 19, I believe that the core of this issue comes back to simple values. Do unto others. The importance of thinking to yourself, “How would that make me feel?” Identifying with others. Caring. Our fundamental humanity. The issue of bullying is about the importance of compassion, tolerance, kindness, and empathy — at a time in life when empathy does not come easily to many middle schoolers. Stories can help. Like Wonder, by R. J. Palacio, to cite one recent, brilliant work of children’s literature. I read it recently and then pressed it into my 5th-grade daughter’s hands. You must read this, I said. I loved the way, like any great book, Wonder brought us into the hearts and minds of different characters. How we experienced forms of bullying, of painful isolation, from the inside out. I loved Palacio’s message of kindness and compassion. Plenty of adults are skeptical about the fuss over bullying. “How come the thin-skinned kids nowadays can’t handle the bullying that made us better, stronger adults?” one man wrote to me on Twitter. You want to reach out to these kids and envelop them in a big warm hug and tell them that they are smart, sensitive human beings, a thousand times better than their tormenters. To read the winning essays, go here. Just do it. Teenage girls are cruel super-humans from a distant galaxy sent here to destroy us all. They have the self entitlement of a celebrity heiress and the aggression of a Roman Gladiator. Like vampires they feed off the blood of the weak. They’re pubescent monsters. Adolescent boogeymen. While my observations may be coming from a point of bias, that doesn’t mean they are faulty in accuracy. As a teenage girl myself, I think I know teenage girls quite well. Not only was I a former teenage mean girl, but I was tortured, tormented, isolated and socially maimed by them as well. 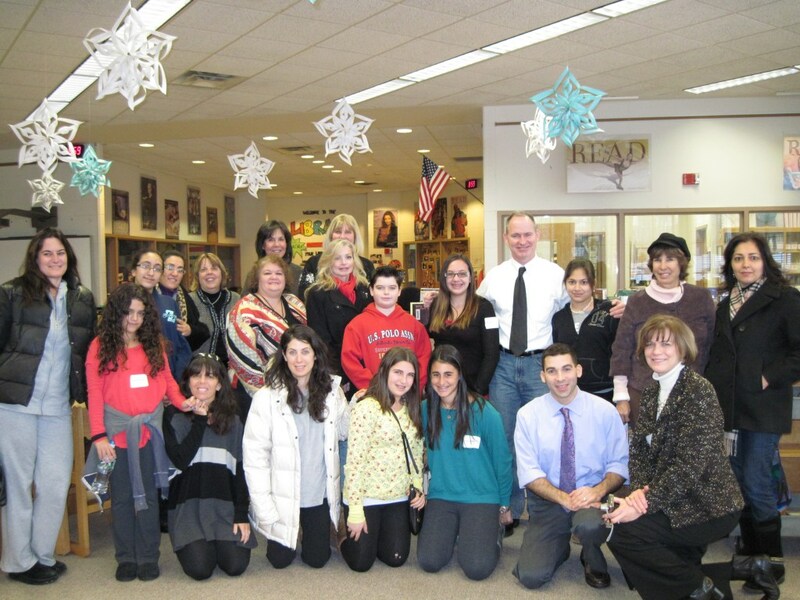 Just came across this school that featured a booktalk about Bystander, way back in 2011. I appreciate that this kind of thing has been happening in many schools across the country, and sometimes on a schoolwide scale, but this one is especially sweet since I grew up in Nassau County, too. I just love the idea of parents and kids coming together and talking about this stuff — that this book, my book, offers a safe springboard for those conversations. Wow. Lastly, here’s a recent Doonesbury . . . still kicking it after all these years.